Tender and moist, this scratch made Sour Cream Coffee Cake with pecans is the perfect coffee cake for breakfast or brunch. 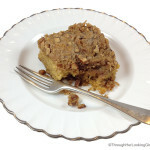 Sour cream and pecan streusel topping make this a five star coffee cake you’d expect to find in your local coffee shop! Well it’s been a wonderful but freezing week here. Ever since I told you in Little Experiment about that Sour Cream Coffee Cake with pecans that our wonderful Ravelry hostess baked us on Monday, I’ve been thinking about it. And how all my boys would love to wake up to that coffee cake this weekend. I didn’t even know if I had the ingredients on hand, but hunted in the pantry, rustled up some pecans kind southern friends sent for Christmas. 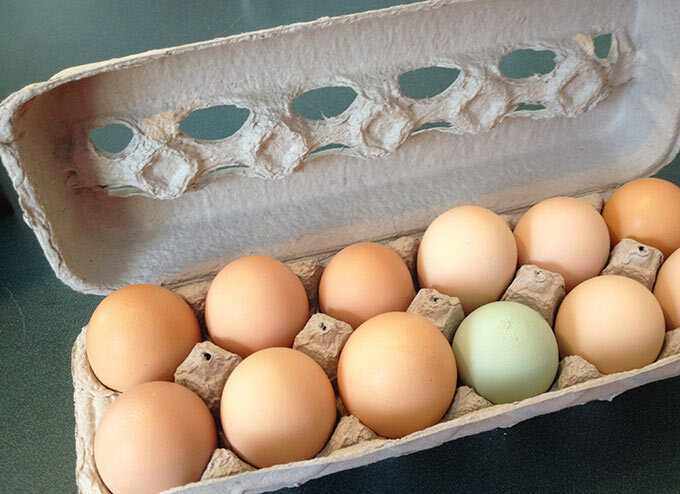 Then I was presented with a gift, a carton of farm fresh eggs this very morning. YES! Even a green one in the mix, totally made my day. That green egg was my green light to go ahead and make this Sour Cream Coffee Cake today. It was easy to make, just ten ingredients. No surprises. Then I thought about you. How I’d told you about it earlier this week, how dense and wonderful it tasted…. and likely your mouth was watering too. So to be fair, thought I should share it here. Hopefully you’ll have the ingredients on hand. (Or some kind soul will show up at the door with them. Ha.) 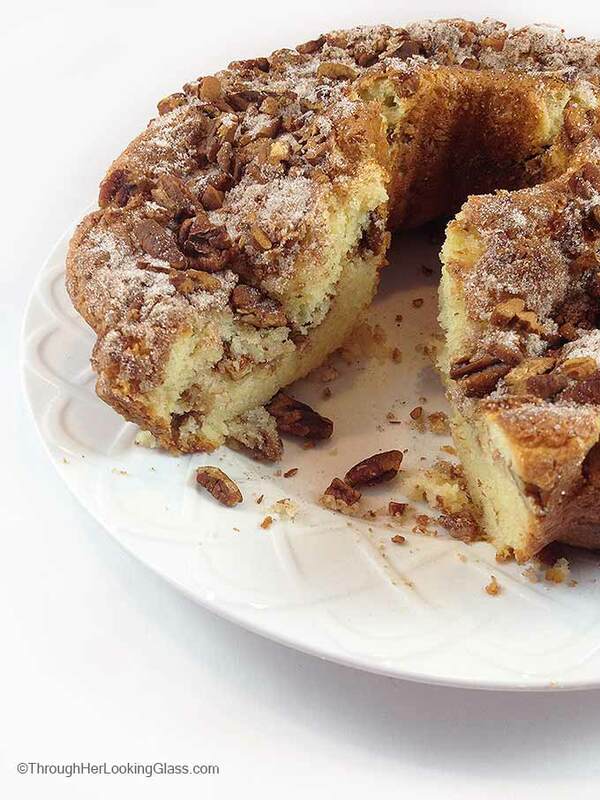 Bake this coffeecake in a bundt pan. If you don’t know what a bundt is, you’re in good company. 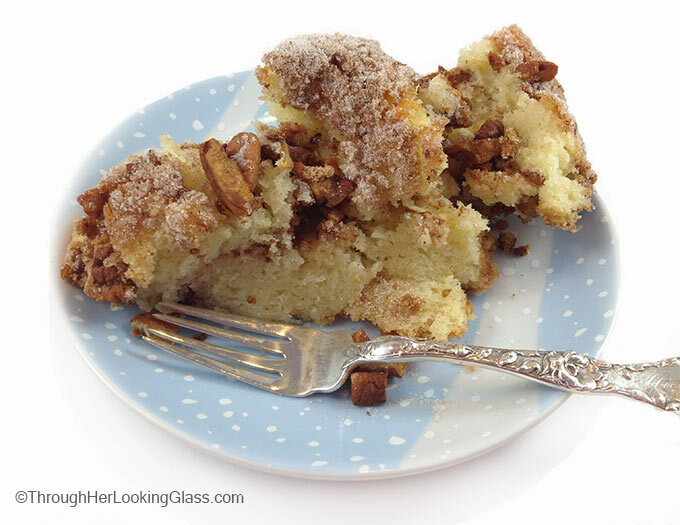 This coffee cake recipe comes from The Silver Palate Cookbook. “Enriched with full-color photographs in honor of its twenty-fifth anniversary, The Silver Palate Cookbook is the beloved classic that brings a new passion for food and entertaining into American homes. 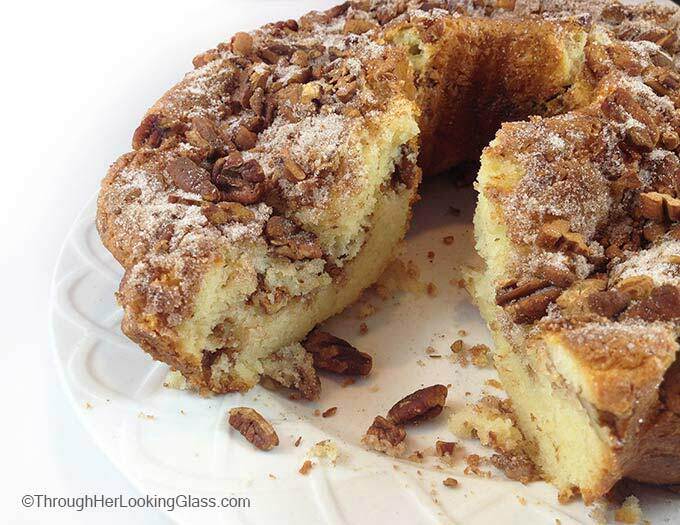 Sour-Cream Coffee Cake: A moist, dense coffeecake with pecans, perfect for brunch or any other special occasion. Grease a 10 inch bundt pan and lightly dust the inside with flour. Cream together butter and 2 cups of the sugar. Add eggs, blending well, then sour cream and vanilla. Fold dry ingredients into the creamed mixture, and beat until just blended. Don't overbeat. In a separate bowl, mix remaining 3/4 cup sugar with pecans and cinnamon. Pour half of the batter into the bundt pan. Sprinkle with half of the pecan and sugar mixture. Add remaining batter and top with the rest of the pecan mixture. Set on the middle rack of the oven and bake for 55 minutes at 350° or until cake tester inserted in the center comes out clean. Serve warm, 30 minutes after it comes out of the oven. So glad you posted this wonderful recipe. It is so incredibly good! We have been baking it for years. This coffee cake is on our Christmas Morning Breakfast menu. 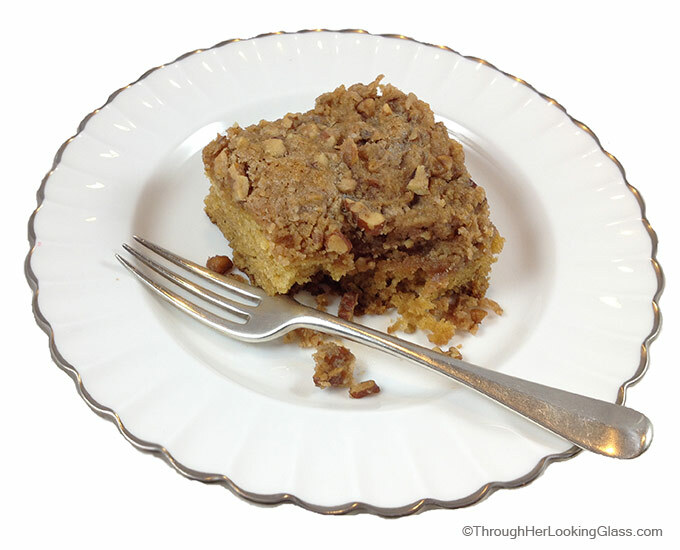 My boys tell me because of this coffee cake this is their favorite meal! We have a lot of favorites from that cook book. Did your boys love it too? Great pictures! I want to go make it now!!!! Hi Francine, Tracy gave me the recipe for the Sour Cream Coffee Cake featured on this post. It originally comes from the Silver Palate cookbook. I hope you love it as much as we do! Thanks for Sour-Cream Coffee Cake recipe!! My cousins wife, from Mass. has made many wonderful recipes from The Silver Palate Cookbook. Many times on holidays we delighted in her gourmet dishes, especially her vegetable combinations, which were varied and different. Bought the cookbook but never did make anything from it -tsk-tsk(:'( Hope you all enjoy cake this miserable, snowy weekend. This sounds delicious, and I thought My Big Fat Greek Wedding was one of the most hilarious movies ever! Made me laugh too. A buuuuuundt! Thank you for posting the recipe. 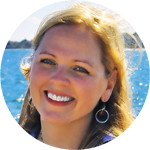 I now I will enjoy it, and so will my husband and our extended family. I look forward to trying this tasty treat. We made this on Saturday night and served it on Sunday at church. Sitting overnight may have helped it to slice well the next day. We wanted to have lots of servings, and sliced it pretty thin, which gave about 25-30 slices. It was very delicious! Thanks for sharing this Allie, it looks great! Haha, I think of that movie every time I bake or eat a bundt cake!! I love it :) And this cake looks stunning! Oh man those fresh eggs look wonderful and so does this cake! I adore this kind of coffee cake and yours looks amazing!! I love that you added the bundt cake clip from My Big Fat Greek Wedding! You should have had a potted plant in the center of yours, haha! Great recipe! Oh dear - Allie - there's a hole in your cake!!! Quick - lets put a flower in it !!! :) I adore bundt cakes - I think It's because I simply cannot master them at all! Your version is exceptional - and so perfect for #nationalcoffeeday! I love a good sour cream coffee Cake! Thank you for posting this recipe, I need to try it! Hi, your cake looks scrumptious! Cant wait to try it. Just a simple question though. Your cake s name has coffee but your recipe doesn't. Am I missing something? Hi Zainab, sure hope you love this cake. There are many cake recipes on my blog called coffee cakes, and none of them have coffee in them. I know, crazy huh? I believe these yummy breakfast cakes are called "coffee cakes" because they are a cake that is delicious served alongside a steaming mug of coffee. Thank you so much for dropping by, have a wonderful day! Hi Zainab - so glad you loved the cake. That sour cream really does the trick to make it moist. I know, I wish there was a way to attach pictures here in the comment section too. But you could always post one on the Through Her Looking Glass FaceBook page https://www.facebook.com/ThroughHerLookingGlass/ if you are on FaceBook. Would love to see your cake! Thanks for dropping by and happy baking. The recipe is different from the cookbook.additional cup of sour cream,less nuts etc.is the cooking time the same?